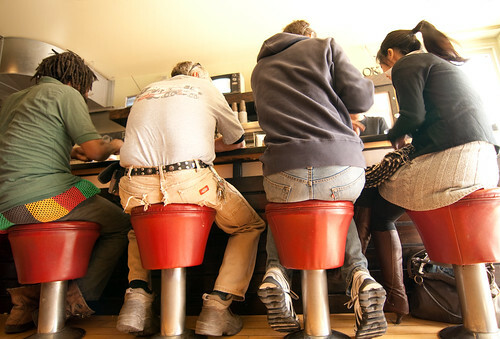 Brunch Butts, a photo by Michael Mitchener on Flickr. If you know any of these people, don't tell them about this picture. Taken at the funky OK OK Diner in Leslieville one sunny Sunday morning over a delicious brunch. The technique used (no, I wasn't lying on the floor) was to balance my camera on my knee under the table at the booth across the aisle and to shoot more or less blind between bites of French toast. Check out OK OK if you haven't been before, it's a great spot.